Anthony Ridgway is a role model for all of us in that he really does make the best of the abilities that he has. 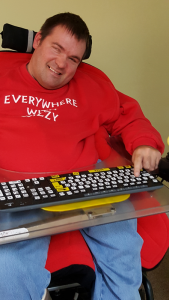 As Anthony explains in his VIDEO ‘How I Write’ (see below), he has cerebral palsy and needs to use an electric wheelchair. He has however the assets of excellent hearing, imagination and the love for a good story – and for a laugh! This is not to say the journey to writing a book has been easy – it has taken great perseverance and hard work, encouraged by his parents first and then studying creative writing as an adult at Eastleigh College under the tutelage of Barbara Large MBE, who is the founder of the Winchester Writers’ Conference, now called the Winchester Writers’ Festival. 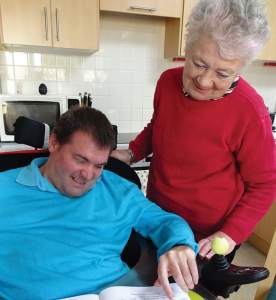 Anthony’s children’s stories about Wizzy, the wheelchair, have been described as the best of Enid Blyton and Knight Rider, but they are more than that. In the video below Anthony explains ‘How I Write’. 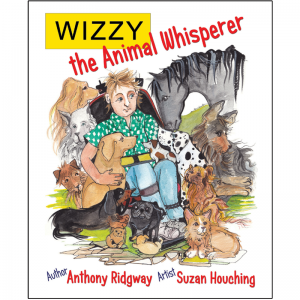 The book launch for WIZZY the Animal Whisperer was held at The Point, Eastleigh, on 29th October 2016. 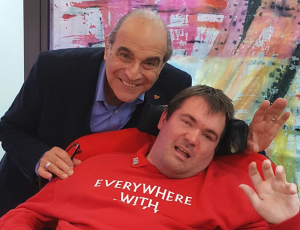 David and Sheila Suchet attended and delighted everyone with their reading from the book. A farm holiday becomes so much more than Dan and Wizzy expect, when a quiet ride down a country lane with their friends, James and Sophie, exposes a mystery. The team’s detective skills get them into danger and they discover there is more to Wizzy than any of them had guessed. 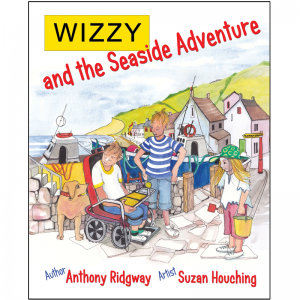 Anthony’s adventure story has a unique take on life – just as he has always been reliant on his wheelchair, the children are reliant on Wizzy’s skills to solve the problems they come across. But it’s not all plain sailing, especially when Wizzy can’t understand the idiosyncrasies of human speech. With Suzan’s wonderful watercolours the story comes to glorious life, touched with humour and character, adding another dimension to be enjoyed by the reader. See the website blog about this great BOOK LAUNCH!